Maybe it was Leon Wagner’s bad luck to have been born too soon. A major-league outfielder for 12 years, Wagner was a two-time All-Star who averaged 29 home runs and 87 RBIs from 1961 through 1966. Still, because of fielding deficiencies that were either imagined (his opinion) or real (his managers’ views), he always seemed to be fighting for playing time. His final season in the majors was 1969, just four years before the advent of the designated hitter, a spot that would seem to have been a perfect fit for him. Leon Lamar Wagner was born on May 13, 1934, in Chattanooga, Tennessee. He and his parents, Eugene and Hattie Lee Wagner, moved to the Detroit area when Leon was an infant, when his father was hired by a foundry. In 1952 Wagner graduated from Inkster High School — Inkster is now a town of 30,000 about 20 miles west of Detroit. He was a three-sport athlete for Inkster’s Vikings, starring in baseball, basketball, and football. Wagner next enrolled at Tuskegee University — then known as Tuskegee Institute — in Alabama, on a football scholarship. He was there for three semesters before returning to Michigan, where he found a job in the auto industry. Before the 1954 season, New York Giants scout Ray Lucas signed Wagner, who was playing for a sandlot team called the Inkster Panthers. Wagner was sent to the Danville (Illinois) Dans of the Class-D Mississippi-Ohio Valley League that spring. He played in 125 games for Danville and led the league with 160 hits. He had 24 home runs and 115 RBIs, that latter figure still a Danville team record, and hit .332. In a sign of things to come, Wagner also led the league’s outfielders with 14 errors. The offensive numbers persuaded the Giants to move Wagner up a step to the Class-C Northern League in 1955.Playing for the St. Cloud (Minnesota) Rox, he led the league with 29 home runs and 127 RBIs and hit .313. Once again, he committed 14 errors in the outfield. The next year with Danville (Virginia) of the Carolina League, he batted .330 and led the league with 51 homers and 166 RBIs. With Danville he played with three other future major-league stars — shortstop Jose Pagan, third baseman Tony Taylor, and first baseman Willie McCovey. After the 1956 season Wagner was drafted into the US Army, with whom he spent 14 months at Fort Carson, Colorado, driving a Jeep. After the year off from baseball, the Giants advanced him to Phoenix in 1958 to join their new Pacific Coast League team. The New York Giants had moved to San Francisco, and their top farm club was now in Phoenix. Wagner’s stay was brief. After 65 games in the PCL, in which he hit .318 with 17 home runs and 58 RBIs, he was recalled by the Giants and made his big-league debut on June 22, 1958. What didn’t improve was his hitting. Playing sparingly and often only as a pinch-hitter, Wagner appeared in only 39 games for the Cardinals with 4 home runs and 11 RBIs. One of those home runs may have meant a bit more to him than the others. On April 12, in his first time back in San Francisco since being traded, Wagner hit the first-ever home run at Candlestick Park, the Giants’ brand-new stadium. Wagner was hitting .214 on June 15 when the Cardinals optioned him to Rochester. Things improved somewhat in the International League, where he hit 16 home runs and drove in 48 in 93 games, but his .265 average marked the first time he had been under .300 in the minors. While Wagner was too early to take advantage of the DH, he was just in time for baseball’s expansion. The American League had operated with eight teams since it was established in 1901, but two new clubs — the Los Angeles Angels and Washington Senators — had been created and would begin play in 1961. The same writer asked Rigney how good he thought Wagner could be. “He can be one of the very best,” Rigney said, “and he can hit 40 or so home runs. If he keeps away from bad pitches, he will become one of the American League’s outstanding hitters.”11Rigney was right. Wagner enjoyed the best year of his career in 1962, setting personal records for home runs (37), RBIs (107), doubles (21), triples (5), and base hits (164). He hit .268, and finished fourth in the MVP voting. From 1959 through 1962, there were two All-Star Games each year. Wagner was MVP of the second 1962 game, at Chicago’s Wrigley Field, with a two-run homer, two singles, and a key catch in the AL’s 9-4 win. Of his catch, which took an extra-base hit away from George Altman, Wagner told writers: “A man don’t have to be a bad fielder all his life. It isn’t that hard to catch baseballs.”12 He called the All-Star Game performance “the biggest thrill of my life.”13 In large part as a result of Wagner’s great year, the Angels finished third with an 86-76 record in only their second year of existence. Wagner had another great start in 1963, contending for the league lead in home runs, batting, and RBIs until mid-July. He then cooled off, finishing at .291 with 26 home runs and 90 RBIs, but earned another All-Star Team selection. The deal turned out to be as one-sided as it had seemed it might be. Latman was 6-10 as a part-time starter and reliever in 1964, while Adcock hit 21 home runs for the Angels, but with only 64 RBIs. Wagner, on the other hand, enjoyed one of his best seasons in his first year in Cleveland. Playing in 163 games, he hit 31 home runs, drove in 100 runs, and even stole 14 bases, displaying a side of his game not seen before. Wagner’s numbers dropped again in 1967. Now 33, he had just 15 home runs and 54 RBIs while platooning with Colavito. Still, he went to spring training with the Indians in 1968 predicting he’d hit 40 home runs “if they’ll let me play every day.”25 Alvin Dark, the new manager, reportedly had little confidence in Wagner’s defensive skills, and played him sparingly at the start of the season.26 On June 13, he was traded to the Chicago White Sox for Russ Snyder. Wagner’s playing career was nearly at an end. 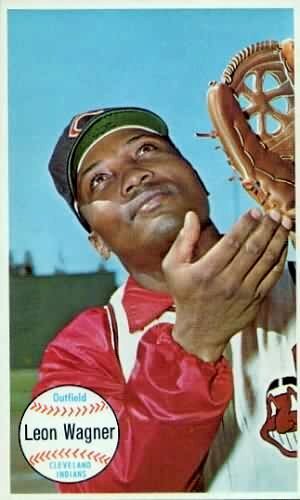 After spending spring training in 1969 with the Cincinnati Reds, he was eventually signed to a minor-league contract by the Giants, who assigned him to Phoenix in May. He got into 78 games, hitting 6 home runs, driving in 41 runs, and batting .295. In June, he said he was pleased to be back in the minor leagues, free from pressure.28 He hinted that he was considering an offer to play in Japan, but nothing came of it. Teammates voted Wagner the club’s Most Inspirational Player. He got a late-season call from the Giants, appeared in 11 games and had 4 hits in 12 at-bats. He played his final game in the major leagues on October 2, 1969. He was released six days later. Wagner returned to Phoenix for 45 games in 1970 but hit only .189. Wagner gave baseball one last try in 1971, signing with the Pacific Coast League’s Hawaii Islanders as a coach and player. He was a full-time coach for a month, but hit a two-run home run in his first at-bat in more than a month. He also was married in Honolulu that year. In 75 games, Wagner had 9 home runs, 33 RBIs, and a .252 average. The San Diego Padres’ farm team had several other former major-league players, including Clete Boyer, Lee Maye, and George Brunet. In those pre-free-agency days, most players had to work winter jobs to augment their baseball salaries. While with the Angels, Wagner was partner in a men’s clothing store that used the slogan “Buy your rags from Daddy Wags.” He also was a partner in a record store and worked briefly as a Los Angeles County youth counselor. Wagner’s post-baseball life was nothing like what he had envisioned after that conversation with Gabe Paul back in 1967. He tried acting, appearing in John Cassavetes' 1974 film A Woman Under the Influence, and as a member of a 1930s barnstorming team in The Bingo Long Traveling All-Stars & Motor Kings, two years later. He sold cars for three years in Honolulu after his playing career ended and held a similar job after moving to Los Angeles. He did public-relations work for a Los Angeles-area racetrack. He and his wife were in the news briefly early in 1972 when he was beaten and she received minor gunshot wounds when gunmen confronted them near the Wagners’ Los Angeles apartment in an apparent robbery. Johnson said that Wagner’s son, Leon Jr., and daughter, Lei Juana Wagner, repeatedly tried to help their father in his later years but were rebuffed. Wagner was married to Sherry Stewart in 1959, to Doris Jean Hudson in 1965, and to Phyllis Crawford in 1971. All three marriages ended in divorce. An updated version of this biography appeared in "From Spring Training to Screen Test: Baseball Players Turned Actors" (SABR, 2018), edited by Rob Edelman and Bill Nowlin. Daniel, Dan. “Do Giants Rue Trade of Spencer to Cards?” New York World Telegram, March 31, 1964. Dolgan, Bob. “A Perfect Blend of Homers and Humor,” Cleveland Plain Dealer, January 9, 2004. Dyer, Braven. “Cheerful Cheeky — He’s Bad Joke to Chuckers,” Los Angeles Times, April 6, 1963. Dyer, Braven. “Wagner’s Wails Rankle Angels, Bring Hot Reply,” Los Angeles Times, March 21, 1964. Jacobson, Steve. “Leon’s New Image: Leather Craftsman,” Newsday, July 31, 1962. Lustig, Dennis. “Whatever Happened to Leon Wagner,” Cleveland Plain Dealer, exact date unknown, 1980. “Wagner Is Real Good Hitter,” San Francisco Examiner, July 13, 1958. United Press International, April 1, 1969. 1 Curley Grieve, “Giants’ Top Brass Tabs Wagner One of Coming Greats in Batting,” San Francisco Examiner, August 23, 1958. 2 Curley Grieve, “Despite Slump, Mays Still Greater Than Anyone Else; Does Everything,” San Francisco Examiner, July 13, 1958: 10. 4 Joe Donnelly, “Players in the Corner,” Newsday, August 11, 1964. 5 Dan Daniel, “Do Giants Rue Trade of Spencer to Cards?” March 31, 1960. Unidentified publication in Wagner’s Hall of Fame file. 6 Stan Isaacs, “Life With the Giants Too ‘Salty’ for Leon,” Newsday, March 15, 1960, in Wagner’s Hall of Fame file. 9 Associated Press, “Wagner, ex-Card, to Angels,” April 14, 1961. 10 Braven Dyer, “Angels’ Wagner Believes He’s Capable of 61 homers,” Los Angeles Times, May 6, 1962. 12 Dan Daniel, “All-Star Win First Since ’59,” New York World Telegram, July 31, 1962. 14 Braven Dyer, “Daddy Wags Demolished Tribe Hurlers,” Los Angeles Times, December 21, 1963. 16 Regis McAuley, “Daddy Wags Beats War Drums, Injuns Awaiting Game Hum,” Cleveland Press, June 13, 1964. 18 Regis McAuley, “Daddy Wags Beats War Drums, Injuns Awaiting Game Hum,” Cleveland Press, June 13, 1964. 20 Russell Schneider, “Leon Wagner,” Cleveland Plain Dealer, July 17, 1965. 22 Hal Lebovitz, “Wags Hits Clean-up on Young Toughies,” Cleveland Plain Dealer, March 20, 1965. 23 Russell Schneider, “Daddy Wags, Playing Regularly, Puts Pep Into Sputtering Indians,” Cleveland Plain Dealer, August 20, 1966. 24 Russell Schneider, “Daddy Wags Eyes Buckpasser Role,” Cleveland Plain Dealer, February 18, 1967. 25 Russell Schneider, “Daddy Wags Promises 40 HRs ‘If They Let Me Play,’” Cleveland Plain Dealer, March 16, 1968. 26 Russell Schneider, “Indians Obtain Hall and Snyder to Buttress Flychasing Brigade,” Cleveland Plain Dealer, June 29, 1968. 27 Jerome Holtzman, “Intelligent’ — That’s Wags’ Word for White Sox,” Chicago Sun-Times, July 6, 1968. 28 Regis McAuley, “Daddy Wags Enjoys Minors — Less Pressure, More Laughs,” Cleveland Press, June 21, 1969. 29 Bill Plaschke, “Bitter Ending,” Los Angeles Times, January 25, 2004. 31 Hal Lebovitz, “Sad Ending,” Lorain (Ohio) Morning Journal, January 11, 2004.